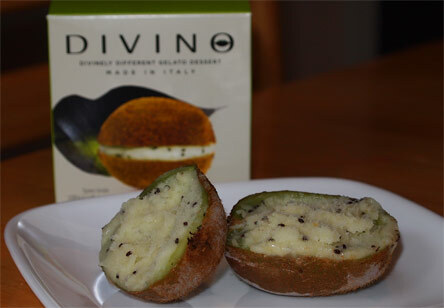 [New to the US in 2014] Out of the blue, Divino Dessert contacted me about trying their very unique product line. 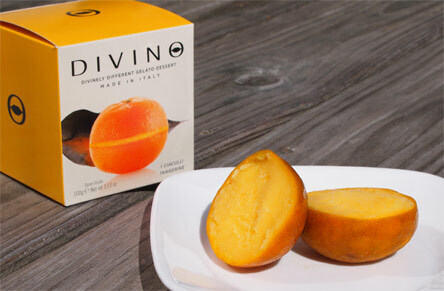 It's fresh fruit picked from the Amalfi coast of Italy, cored, and then transformed in to gelato and sorbet and placed back in to the fruit shell. While you guys know I'm not the biggest fruit addict on the planet, I was absolutely mesmerized by the idea and visuals of this product. This stuff even has an awesome backstory as this dessert was created over 80 years ago in Italy. This treat is well known in Europe and now it's time for it to hit the states. sunny deck would do this treat justice... it did not. This may sound silly, but may favorite part is the that wonderful smell of fresh fruit. It's undeniable and all encompassing. In one way it won't even matter what it tastes like because I'm already in a happy place. I dig in and it's good, really good. I know all of the boxes say "divinely different gelato dessert", but the actual description is sorbet, and not just any sorbet. 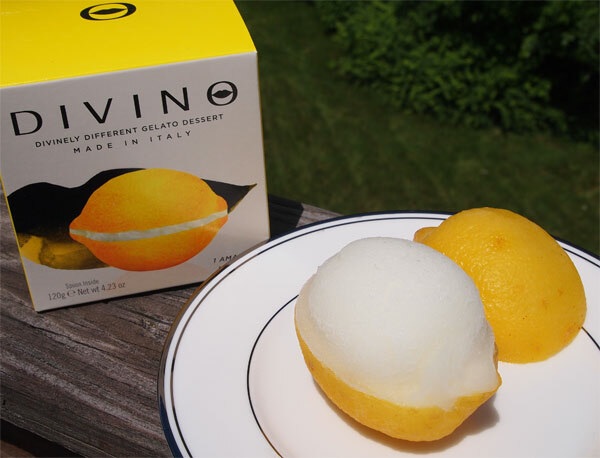 It's sorbet made from 72% ciaculli tangerine pulp. Mmmm, so much flavor. They include a tiny spade for scooping and it reminds you take this treat nice and slow (because frankly I could eat two or three of them). Alright, I decided to try the Roman kiwi second simply because there are two in my shipment and that'll give me time to adjust to a fruit I rarely get around to eating (sorry, I'm just not that creative in my snacking). Now this one is a gelato and not a sorbet and you can definitely detect the creamier difference. I like it, and you have to admit, it's stunning. While some of you may not dig seeds in your food, theses ones are small and more importantly they totally sell the visual here. Man this is a great looking product. I'm digging the crispness of the flavors here, and if you are curious, yes, there is a good amount of kiwi bite to this one. Sorry, I couldn't resist setting it up this way. This is the black diamond plum gelato and once again this is an excellent treat. I know I don't eat many plums (though I had a few a couple of months back), I'm surprised by the mild flavor of this one. It's good, but so far it's the most mild of the three (I know, I know, this really shouldn't be that surprising). My big mistake here was eating this with a regular spoon instead of the little spade. Yeah.... I devoured it in about 60 seconds. Maybe I should have eaten my muffin first. 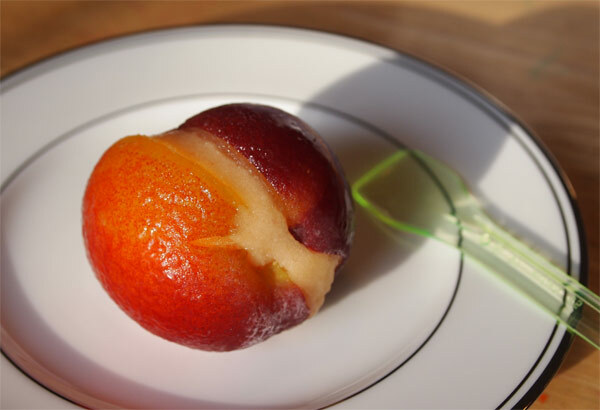 Ok, time for the peach... wow, apparently Apulian peaches aren't that big! There's no huge peach smell, but man do I love the flavor on this one (that is made up of 50% peach pulp). 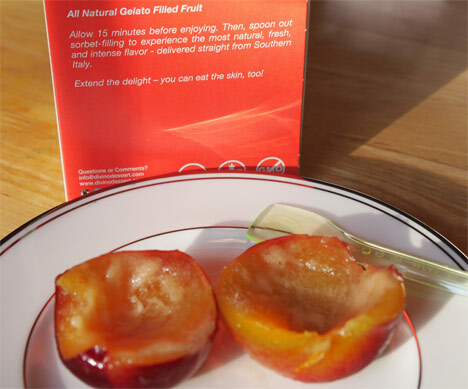 Peach translates great to sorbet, why do more companies not do this? It's simple and just great in the morning. Man I could ate a half dozen of these. "Extend the delight - you can eat the skin, too!" Ok, last single serve treat in my shipment, Amalfi Lemon .... smells great.... and yes, it's as good as all the others... and now I'm sad they are all gone. I love the clean, crisp nature of these treats. Simple and perfect. This one reminds me of super high end Italian ice and you don't want it to end, but sadly it does, just like the others. So, there you have it, what will most likely be the fanciest product we'll ever have all the blog. I mean, what's fancier than serving gelato or sorbet in the fruit that it came from? Plus, now I think I'm officially a fan or sorbet. I just needed the right product to win me over and it has. Excellent job on these. You're probably wondering where you can get these right? Well, technically you can buy them online here, but it's meant for bulk purchases (6 case minimum, each case is 12 pieces). Basically it's meant for a function or reseller. Hopefully at some point we'll see these pop up at like whole foods or a co-op so we can share the uniqueness that is this treat. Update: These actually have popped up on freezer aisle shelves like price chopper and a few other places.